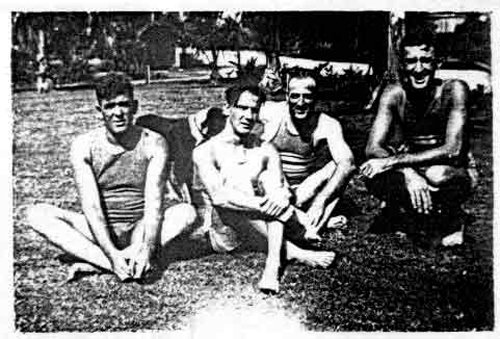 Chief Radiomen at Wailupe, Hawaii on 1919 (L to R): E.L. Harris, W.G. Tichenor, O.H. Scott, and my grandfather H.B. "Skinny" Phelps. My grandfather Harold Bartle Phelps served in both World Wars as a telegrapher and radioman. He spent WWI on various ships around the world and afterward in Wailupe, Honolulu. This story is about the radio station on Wailupe, Hawaii, after World War I. Lt. Phelps was stationed at Wailupe f rom 1919 until 1922. Lt. Phelps was married in Honolulu to Betty Christy on April 6, 1920. She joined Bart on Wailupe in 1921. The operating building was located over water on the shore of the bay. ( extends from Diamond Head to Koko Head). It was a rectangular, one story building on pilings in the water. The building was divided into compartments or booths, seven on each side separated by a hallway extending the full length of the building. The front of the building contained the wireroom and the Traffic Chief's booth on the left; the office of the District Communication Officer, Lt. Comdr. Frank Loftin, and the office of the Chief Radioman in Charge, D. A. Chauncey, on the right. The wireroom had Morse code land line circuits to the Old Naval Station in Honolulu (HU) for transmission of commercial, other government department traffic and press news despatches for the Honolulu newspapers; and a circuit to the Communication Office in the Pearl Harbor Navy Yard (AD). All message traffic was processed through the Traffic Chief's booth for circuit routing and filing. His story of the establishment of the Wailupe station was published in the Naval Communication Station, Honolulu, Trade Winds issue published 25 June 1970. A portion of that story is excerpted below. When we entered World War I, the Navy simply moved a recruiting crew to the commercial stations and signed up the entire crew in various ratings in the Naval Reserve, put uniforms on them, and continued to utilize their communication skills under Navy supervision. 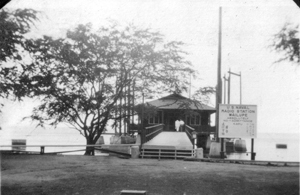 The temporary station at Wailupe was probably built around the first part of 1919 and NFM (Guam) moved there to allow the Kahuku and Koko Head stations to be remodeled. Almost the entire crew of operators at Koko Head was sent to Wailupe as USNR, supplemented by such regular Navy radiomen available. In those days not too many Navy operators had experience in handling commercial traffic. The Navy purchased a piece of land at Wailupe for the temporary station and it was very temporary as plans were in the making for a permanent station at Wailupe. There were three booths, more like chicken coops, scattered on the beach. Each booth, of crude construction, had room for two circuits. The roofs leaked and some of the operators had to sit under an umbrella suspended from the ceiling to keep water off the equipment. Or we would search around the yard for a scrap of tar paper or some boards to lead the water off the operating position. There were no signals piped in. Receiving antennas were strung between trees and poles. All control wires were very haywire, no soldered connections and very few even taped, which brought on intermittent wire trouble, rain or shine. There was an old house on the land. It was one big room, no doors, windows or screens. This housed the office, file rooms, ship-to-shore circuit and the landwire to the Honolulu city office (HU) and the office in Pearl Harbor (PH). Anyone working in this house after dusk had to putt rubber bands around the bottom of their trousers and have several sticks of mosquito punk under their chair to be able to stay there. If they forgot to bring their punk or couldn't find someone else's cache they would stuff an old rag in a can and light it off. Anything was better than those mosquitoes. We stood a three section watch, seven days a week, no rotation of watches, no days off. Straight 8 on and 16 off, and that's the way it was at the start of NPM at Wailupe as a Government and commercial traffic station. The Naval Radio Station was constructed over the water to provide more space on land for headquarters offices. When I went there in August of 1919, NFM had schedules with NFL (San Diego), NPU (Tutuila, Samoa), NFN (Guam), and NPO ( Cavite) . There was no direct daylight communication with NPO or JJC (Japan}. NPO broadcast to NFM at midnight. NPU broadcast to N!M at 2 a.m. and NFM broadcast to NPU at 9 a.m. None of those circuits were reliable at all times due to static and fading periods. We just kept the traffic moving as best we could, all by hand, on low frequencies. Practically all traffic for Cavite and the Asiatic Fleet was relayed through NPN. The Navy had been searching around for a piece of land for the permanent station and finally had found some school land that was suitable, for which they traded the temporary site, and started construction of the permanent. buildings. The new site also gave room for expansion up the hill in back of the reservation. The station was completed early in 1921. It was built over the water to provide more land space for the proposed District Communication Officer's quarters, two duplex CPO quarters, and the single men's barracks. These were completed late in '21 or early in '22. About that time, the District Communication Officer Lt. Comdr. C. N. Ingraham, and the Chief in Charge of the Wailupe station, made a tour of the outer islands to locate a suitable site for a compass station. They finally decided on Hilo, on the island of Hawaii, where NPH was built. After the December 7, 1941 attack on Pearl Harbor, the Navy realized that the station at Wailupe on the seacoast was very vulnerable to attack. On the morning of December 10, 1941, the District Communication Officer decided to move all radio equipment at Wailupe to Wahiawa. The new site was the best protected radio station of the entire Fourteenth Naval District. Men worked night and day to transfer operations to Wahiawa. The move became a veritable scramble causing facilities to be installed more or less at random. Relocation was completed on 17 December without a break in communications. 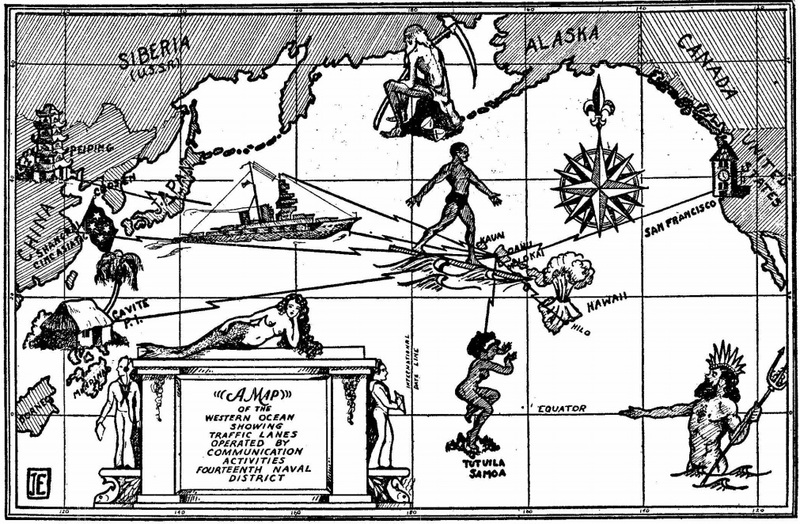 Bart Phelps also wrote about his adventures and misadventures as a radioman on Woody Island, Alaska. For a detailed history of Navy Communications in the Pacific, see Nick England's excellent site, Navy Radio.